The world is thinnest at The Crossroads, a mythical plane that serves as a doorway throughout the universe. It is here that a band of adventurers throughout the Wild West gather, brought together by Gord Cantrell and Abigail Redmayne with a singular purpose: to fight back against the creatures that would endanger the sanctity of all creation. 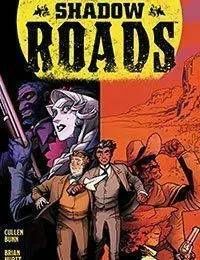 SHADOW ROADS is the set in the world that remains after the conclusion of Cullen Bunn, Brian Hurtt and Bill Crabtrees critically-acclaimed series, The Sixth Gun.